Last week I adapted my Chick-fil-A post for Leadership Journal and yesterday I contributed a follow-up article. I promise: No more posts about Chick-fil-A after this. Though, to be fair, this one is less about chicken and more about church. 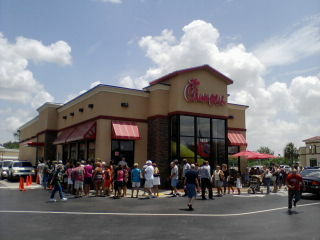 A crowd gathers for Chick-fil-A Day in Florida. Photo by PCHS-NJROTC (cc). It turns out that boycotts are great for business. Last Wednesday Chick-fil-A broke previous sales records as costumers came out it droves to purchase chicken sandwiches and waffle fries in support of the fast food joint. Speaking his mind about marriage may have been the savviest accidental business move CEO Dan Cathy ever made. Some of the comments on my first post questioned whether there is a connection between the threatened boycott of Chick-fil-A and the power of brands. I appreciate the pushback, but the massive outpouring of solidarity (and dollars) on Chick-fil-A Day makes me think I’m on to something. To recap: when our personal identities become enmeshed with that of a company whose product we love but whose values we come to question, we may experience a crisis of identity. At this point many choose to boycott. Or, in the case of Chick-fil-A Day, others come to the rescue of a corporation they feel represents their values. Either way, the chosen response says a lot about where we find out identities. More than one comment made the case that supporting Chick-fil-A had nothing to do with identity or branding; rather, it was an opportunity to affirm besieged Christian values. As one person put it, “I don’t think we have to find any thing sinister or unhealthy in the Christians who take offense at the attack and react by going to get a sandwich. They are not being commercially ‘branded,’ they are simply expressing themselves in a concrete way on a conviction of deep concern.” Many of Chick-fil-A’s supporters probably share this sentiment but it’s not the whole story. Read the rest on the Leadership Journal site.